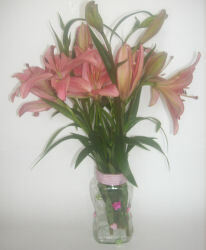 With just a few bits and pieces, children can recycle a glass jar into a pretty vase with this easy craft idea. 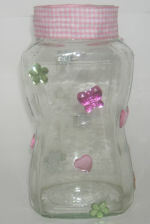 This recycled glass jar craft makes a sweet gift for Mother's Day, Grandparent's Day or a favourite teacher. The craft can be adapted for all ages so that the kids can really be proud of their efforts. Wash out your coffee jar, removing labels and all the paper from rim. Dry thoroughly. Decorate the jar by gluing on the jewels, using stickers and/or painting with glass paints. Using strong glue, stick a ribbon around the rim to cover the screw top pattern. Here's a really special recycling and sewing craft that results in a really special gift. We've themed ours for Valentine's Day but of course you could adapt this in many ways. Obviously much care and supervision is needed as this craft uses bleach.